This illustration has been realized for "Terribili dinosauri!" Edicart. It represents an ancient sea with different reptiles, some fishes and many invertebrates like jellyfish and ammonites. 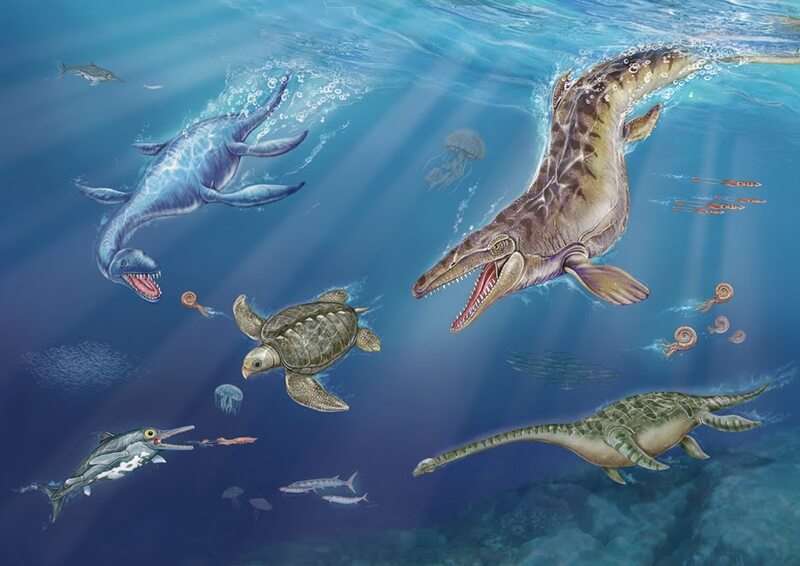 On the left side there is a Plesiosaurus (living in early Cretaceus), then an Archelon ischyros (living in late Cretaceous), the bigger sea turtle ever existed: the largest specimen was over 4 m long and 4,9 m wide, from flipper to flipper. Below there is an Ichthyosaurus (living from the late triassic to early jurassic), similar in appearance to a modern dolphin, but it was a reptile not a mammal. On the right side there is the Mosasaurus (late Cretaceous), a very big predator. Below there is an Elasmosaurus (early Jurassic) characterized by a very long neck and a small head.